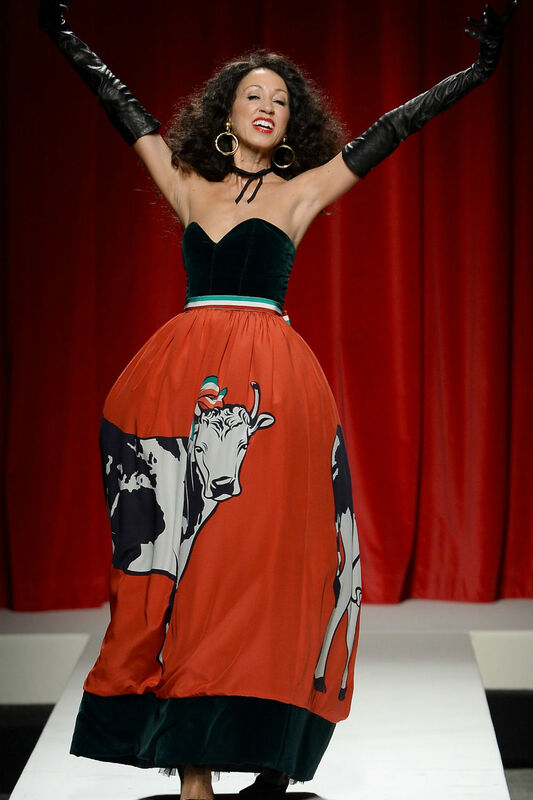 Moschino: one of Milan Fashion Week’s most hotly anticipated shows. Especially since Jeremy Scott took the creative reins four seasons ago. McDonald’s Fries bag? Yes, please. But for flamboyant pop-culture statements, house founder Franco Moschino could have given Gaga a run for her money. Ahead of his time in so many ways, while the rest of Eighties and early Nineties Milan peddled camel overcoats, he filled his runways with irony and subversion, taking aim at the fashion victims who queued up to buy his clothes. Gold clothes pegs for buttons, necklaces made out of Rolex watches, models dressed in carrier bags… the fash gags were endless. Always keen to poke fun at an industry that took itself way too seriously, Franco’s take on Cruella de Vil-style furs? 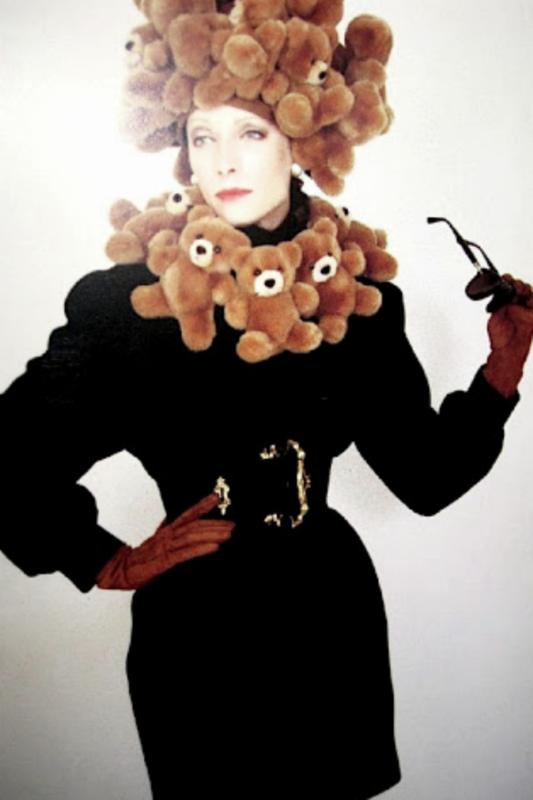 A winter collection featuring coats of stitched-together teddy bears, of course. 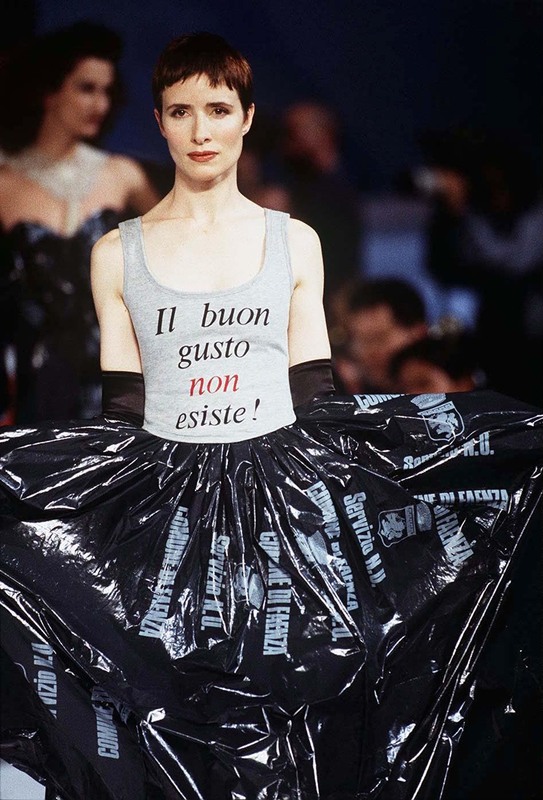 The T-shirt read ‘Il buon gusto non esiste!’ – good taste doesn’t exist – and Franco underlined his point with a matching skirt made of shredded bin liners; a perfect combo, if you ask us. 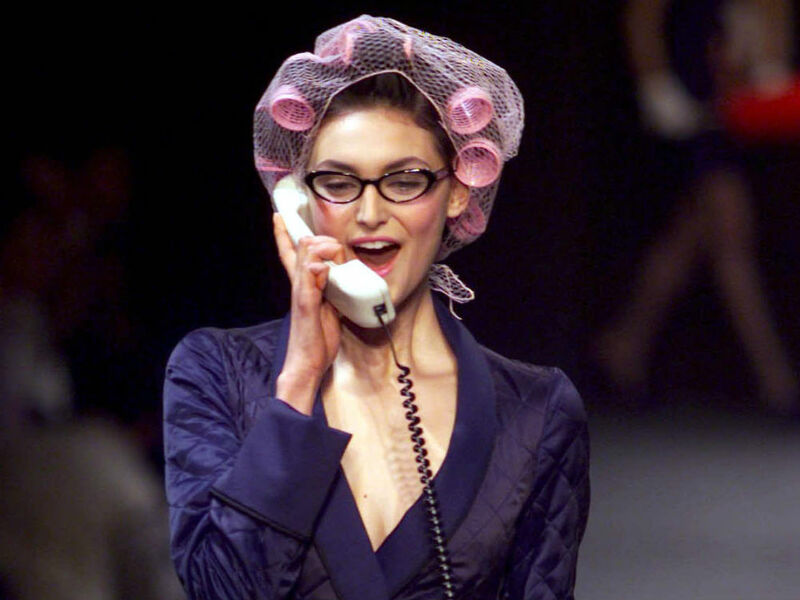 Models played housewives in a play on gender sterotypes. Highlights included girls wearing rollers and dressing gowns, gossiping on the phone, naturally. The SS10 outing for the brand which isn’t afraid to go OTT started off as a very ladylike affair, think monochrome skirt suits (albeit with a mini rather than a midi). In true Moschino form, the show didn’t stop there with it graduating into the rebellious sister territory – think chain mail jackets, sunglasses afoot and glitzy LBDs. Jodhpurs, helmets and jackets which look distinctly like they could be worn by a member of the Calvary, Moschino’s AW12 collection was definitely a little bit country, dahling. 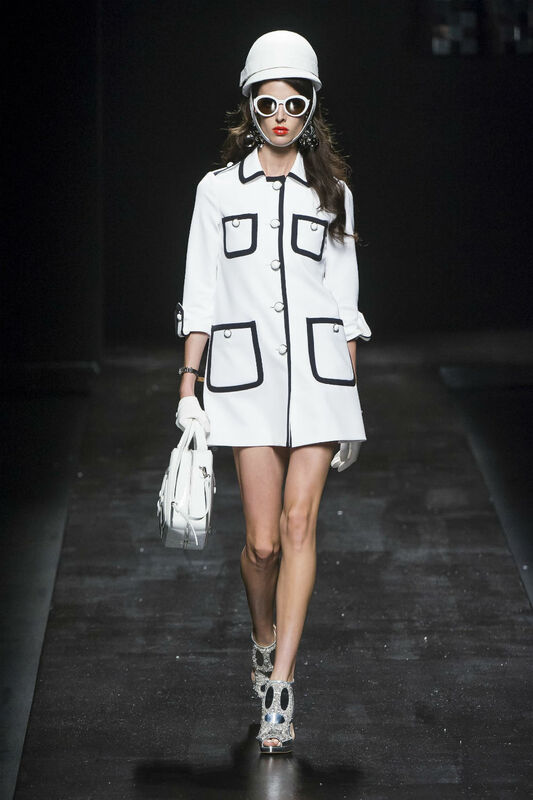 In the midst of the recession, models at Moschino’s SS13 show walked out to the soundtrack of a song whose lyrics urged those in the audience to ‘just have a good time.’ Rosella’s upbeat and energetic collection referenced the 1960s with inspo coming from Audrey Hepburn’s doll-like wardrobe in Two for the Road with an added metallic twist and monochrome madness. Rosella Jardini, the right-hand woman who took over as creative director on Franco’s death in 1994, kept the flames of irony alight at the house for 20 years. Her last-ever show was a barnstorming celebration, including Franco’s favourite model, Pat Cleveland (wearing a dress made of the Italian flag and covered in cows), and a live performance of I Am What I Am by Gloria Gaynor. 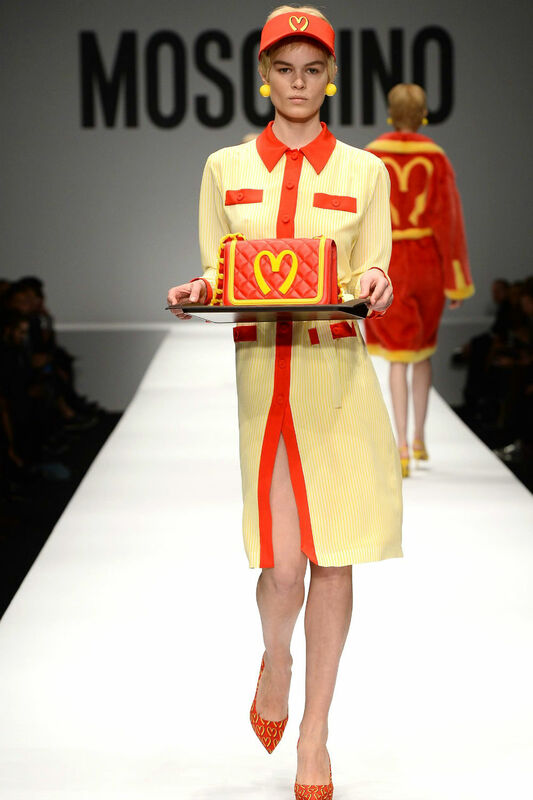 Jeremy’s hotly anticipated debut worked the McDonald’s golden arches into the Moschino heart, turned fast-food servers’ uniforms into a look and generally set the blogosphere on fire with a capsule collection available to buy straight off the runway. We hardly need to remind you of the pink-fest that was last season: models in triple wigs, a finale of flammable floor-length prom dresses and Charlotte Free on rollerskates (check out the latest issue of Marie Claire Runway for the full backstage story). Oh Jeremy, how will you better that on Thursday? Carrying on Jeremy’s penchant for loud, tongue-in-cheek instant cult-buys, the AW15 collection had a distinct rude boy feel to it. Lots of denim, lots of chains and not to forget, lots of cameos from the Looney Tunes lot too plus added bonuses such as full on leather bucket hats, colourful puffer jackets and graffitied finale ball gowns. Eclectic? We think so. Dolls came to life on Jeremy Scott’s SS17 runway through trompe l’oeil versions of iconic Moschino looks. After walking together at Fendi, the Hadid sisters Bella and Gigi both walked in the surreal and brilliant show.